However, with the multitude of cameras available and the similarity in their features, you could be at lost. Most of these cameras are not only weatherproof, allowing users to leave them out in the elements, but also self-powered so you don’t have to worry about power sources. Browning started back in 1805. They sell mostly gear for hunting. Their camera is called the Browning Strike Force Sub Micro 10MP. This measures at 4.5 x 2.5 x 3.2 inches and only weighs one pound. The trigger time measures at a lightning fast 0.67 seconds. The camera records HD videos with sound five seconds to two minutes in length. The flash range goes as far as 100 feet. It takes up to six AA batteries and the battery life will last a long time. The Browning Strike Force Sub Micro 10MP also comes with Browning Buck Watch time-lapse viewer software. On top of that, there is better detection range, crisper pictures, and clearer video are guaranteed with this model. This camera can be found on Amazon at the price of $127.85. Moultrie Feeders first formed back in 1980. Their camera is called the Moultrie A5 Low Glow Game Camera. This is a 5.0 megapixel Low Glow infrared game camera. Features include nighttime illumination range or flash range that measures of fifty feet and long-range 850nm of IR LED Infrared, There is a moon phase, time, date and camera ID stamp. The camera will make sure that the home owner will know the exact time that footage was taken. Picture delay ranges from ten seconds, 30 seconds, one minute, & five minutes. This camera can be found on Amazon at the price of $57.99. Covert first formed back in 2007. Their camera is called the Covert Special Ops Code Black 3G 60-LED Wireless Game Camera. This product measures at 10 x 10 x 3 inches and weighs one pound. The trigger time measures at 1.2 seconds. There are sixty Invisible Flash LED’s. SD cards of up to thirty-two GB are supported, and with user switchable three, five, and eight MP modes actual space can be doubled based on use. The Covert Special Ops Code Black 3G 60-LED Wireless Game Camera takes about twelve AA batteries. Inside Archery voted this camera “2012 Best Buy”. This camera can be found on Amazon, but is very pricey with a recurring fee from AT&T for sim card functionality that can range from $10 for limited messaging or twenty for unlimited, and will vary state to state. Distianert is fairly new being founded in 2016. 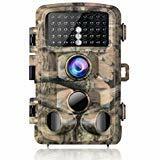 Their camera is called the Distianert Trail Camera 16MP 1080p Wildlife Game Camera. Trigger speed measures at 0.6 seconds with a 0.2 second pre boot time. With no delays, this camera can take up to three pictures at a time. 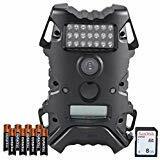 More features include high quality day and night capture with twelve MP crystal-clear colorful images, sharp black and white images, and 1080P HD video with sound, 125° and 80ft detection range, sixty-five ft flash range, and low-glow black covert LED lights. 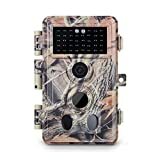 The Distianert Trail Camera 16MP 1080p Wildlife Game Camera is user friendly with a 2.4-inch LCD screen. The product’s case has a big, sturdy and easy-operated latch. For the tripod, it has a threaded insert on the bottom. The camera is also rugged, waterproof (IP56) and can be left outdoors for long periods. It can be found on Amazon at the price of $89.99. Bushnell have been in business over sixty-five years. Their camera is called the Bushnell 8MP Trophy Cam HD Hybrid Trail Camera. This product measures at 12 x 12 x 12 inches and weighs at one pound. Trigger speed measures 0.6 seconds with one to three pictures per capture. Features include 1280 x 720p HD video with audio record programmable length from one to sixty seconds, eight MP high-quality full color resolution, simultaneously capture full resolution images and video on every trigger with Hybrid Capture Mode, and the pictures display date, time, moon phase, temperature and name; GPS Geotag automatically embeds GPS coordinates. The product also has adjustable PIR (Lo/Med/High) or auto PIR, hyper PIR extends PIR sensor 60′ to match flash distance. The Bushnell 8MP Trophy Cam HD Hybrid Trail Camera takes up to four to eight AA batteries that will last up to a year. It also comes with a SD Card Slot with 32GB capacity. Plis, the product has an adjustable web belt and 1/4-20 socket. This camera can be found on Amazon.